Facebook CEO Mark Zuckerberg has checked off Wisconsin from his list of all 50 states where he plans to meet people by the end of the year. He posted photos from his visits on Sunday to Jed Gant’s dairy and beef cattle farm near Blanchardville — and he then stopped in Madison to eat at State Street Brats near the UW campus. 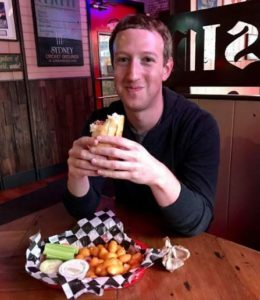 Zuckerberg said Facebook users suggested his dinner stop at State Street Brats — where he said he “basically inhaled” cheese curds and his first brat before he remembered to get a photo of his second brat.